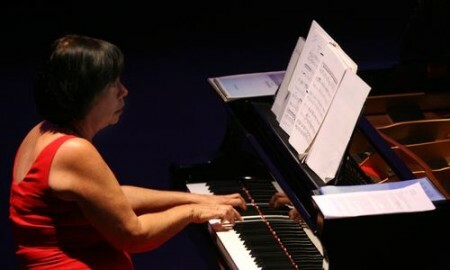 American pianist Ana Cervantes has appeared in numerous concert halls in México, Cuba, and the US, premiering and performing works of such Mexican composers as Marcela Rodríguez, Ramón Montes de Oca, Federico Ibarra, and Arturo Márquez, as well as bringing the music of US composers such as Olga Gorelli, Lawrence (Laurie) Altman, John Corigliano and Charles Griffin to audiences in Latin America. A graduate of Bard College, she counts Joan Tower and Theodore Lettvin as her most significant teachers. In 1999, Cervantes received the Fulbright-García Robles award, for the project of developing a repertoire of Mexican contemporary music for performance in the United States. Since then, she has divided her time between Washington, DC and Guanajuato, México, where she now teaches a chamber music workshop and collaborates in the composition workshop of Ramón Montes de Oca at the School of Music of the University of Guanajuato. Pilar Ortega (1955) was born in Mexico City, where her study of music began with private lessons. She then majored in biology at the Metropolitan Autonomous University, and went on to earn a Master’s in biology at National Autonomous University of México (UNAM). She later entered the National School of Music at UNAM, studying composition with Federico Ibarra. Her Sonata for Piano was given its US premier by Ana Cervantes in 2000 at the National Museum of Women in the Arts in Washington, DC. Alicia Urreta (1930-1986) intiated her studies with Virginia Montoya, later entering the National Conservatory of Music of Bellas Artes, where she studied with Joaquín Amparán, Eduardo Hernández Moncada and Daniel Castañeda, among others. In 1969 she studied early music with Jean Étienne Marie at the Schola Cantorum in Paris. Among her many other activities, she was the director of musical activities at UNAM, coordinator of the National Opera Company of México, and founder of the Camerata de México. A passionate advocate of new music, she was co-founder of the Hispano-Mexican Festivals of Contemporary Music and was its co-ordinator from 1973 to 1983. She composed music for film, dance, musical comedy, and for children. From 1957 until her death she was the pianist of the National Symphony Orchestra, receiving the Music & Theater Critic’s Award on four separate occasions. Lilia Margarita Vázquez (1955) was born in Mexico City, and studied piano and composition at the National Conservatory of México with Mario Lavista and Héctor Quintanar. She received grants to pursue her composition studies at the Center for Investigation and Diffusion of Music with Federico Ibarra, and for advanced work in bassoon and piano in the Escuela Vida y Movimiento (Life & Movement School). She participated in composition seminars with Franco Donatoni and Iannis Xenakis in France and earned a Master’s degree in composition and theory in Kassel, Germany. She has also received grants from the Foundation for Culture and the Arts of the State of México and currently is a member of the National System of Creators of Art. Co-founder of the Society for New Music, she is also associate professor at the Conservatory of Music of the State of México in Toluca. She was pianist for the Da Capo chamber group, performing numerous concerts and recording three discs. Her work for mixed chorus won first place in the Sor Juana Inés de la Cruz national composition contest, and has received commissions from distinguished performers in México and internationally. Tres Estudios was given its US premier by Ana Cervantes in 2001. Georgina Derbez Rocque (1968) is a native of Mexico City. She studied piano with Lea Levine and Marta García Renart, later entering the Escuela Superior de Música where she studied piano with Ana María Tradatti and composition with Arturo Márquez. She currently studies composition with Ana Lara. She has participated in composition workshops with Franco Donatoni, Theo Loevendie, Roberto Sierra, Javier Álvarez, Mario Lavista and Cristóbal Halffter, among others. In 1998 she received a grant from the Foundation for Culture and the Arts (FONCA). Her works have been included in various festivals, including the Manuel Enríquez Form of New Music in Mexico City and the Festival Internacional Cervantino in Guanajuato. Her String Quartet #1 was recorded by the Arditti Quartet during their Interpretation and Composition Work-shop at the National Center for the Arts in Mexico City in 1999. Other works have been recorded by Trio Neos (Music of Women Composers of the Americas, Quindecim Records, 2000) and by mezzo Encarnación Vázquez and pianist Alberto Cruzpietro (Canciones de Luna, Euram Records, 1999). Ana Cervantes gave Cuatro Piezas en Seis Sonidos its US premier in 2001 at the Instituto Cultural de México in Washington, DC. Marcela Rodríguez (1951) was born in Mexico City, and lists María Antonieta Lozano and Leo Brouwer as her most important teachers. From 1994 to 2000 she was a member of the National System of Creators of Art. A prolific composer, her extensive catalog includes works for orchestra, string quartet, chorus, voice, various chamber groupings, percussion quartet and ballet, as well as concerti for guitar, flute and cello. Since 1979 she has been continuously involved in composing for theater and dance, working with the principal directors in México. She is one of the few composers in México today writing opera; her La Sunamita received its premier in 1991 at the festival of the City of México, has been releaed on CD, and was broadcast in 1994 on Spain’s Canal Plus. She often lectures on her work in theater, with special reference to opera in Spanish. Ana Cervantes gave the US premier of Como el Agua en el Agua in Washington, DC in 2001, and in the same year she performed the world premier of Fuego at the Festival Internacional Cervantino.